Today is the release day for Ann Somerville’s SOMATESTHESIA! To help celebrate the release of this science fiction romance, Ms. Somerville has graciously donated two copies of her ebook for a giveaway. Plus, I had the wonderful chance to interview her so the inquisitive passengers of this cosmic locomotive can learn more about the story. Having read her books INTERSTITIAL, ON WINGS, RISING, and REACHING HIGHER, I knew to expect unique settings and characters, compelling M/M romance, detailed worldbuilding, and satisfying social commentary. SOMATESTHESIA is no different. One aspect I particularly like is the near future setting because I don’t read enough and I’m always on the lookout for a good one. (Hmm, I don’t read enough because there aren’t that many). 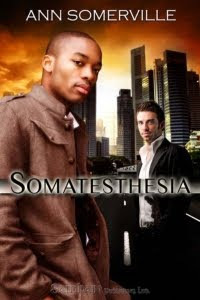 And that title—"somatesthesia" put every other word in my vocabulary arsenal to shame! Yet one more reason I’m proud of being an SFR fan. The story will appeal to readers who enjoy emotionally repressed heroes or heroines such as Admiral Branden Kel-paten from GAMES OF COMMAND by Linnea Sinclair, Alpha from ALPHA by Catherine Asaro, Tarkin from HEAT by Ellie Marvel, and Brit Brander from MOONSTRUCK by Susan Grant. Sensual overload can be a tactical disadvantage. Devlin Grace’s experience with child exploitation cases lands him a new assignment with the Special Crimes Investigators unit of the Federal Justice Agency, plus a new partner who could make the job tougher than expected. Connor Hutchens possesses incredible, scientifically enhanced senses…and zero social skills. Word on the street is that his last partner left under a cloud—and it was Connor’s fault. Connor blames himself for losing his previous partner, and wants to do right by his new one. But Devlin confuses and frustrates him, and he struggles to cope with Devlin’s swift intelligence, quirky humor and teasing sexuality. With the dangerous, perplexing case facing them, there’s no one Devlin would rather have at his back than Connor. But the longer they work together, the higher the sexual tension rises—until attraction boils over and puts everything at risk. Their careers, the children they’re trying to save—and any chance of lasting love. The Galaxy Express: Please tell us the story behind the story of SOMATESTHESIA. What inspired the tale? What was the path to publication like? Ann Somerville: I have no idea where this one came from, except the idea of people with special abilities fascinates me, because though in some ways it would be amazing to read minds or see better than normal people can with the naked eye, having such unusual powers would be fairly isolating. So I started to wonder what it would be like if someone who’d been designed to be a superman, physically, who’d been isolated because of his abilities and upbringing, met someone who was super-sociable. I’ve explored the idea before, notably in my free-to-read Darshian Tales, but I feel I’m a long way from exhausting my interest in the concept. The path to publication was rocky. Though I knew the story was highly saleable, I was at a point where I wasn’t happy with Samhain, and none of the other epresses appealed. So I self-published on Lulu, where sales were pretty good for two months. At that point, a small gay press owner read the story and asked if he could publish it - I had very strong reservations about him personally (which sadly were justified) and about handing over my work to a publisher again, but a friend encouraged me to go for it as a way of breaking out of the romance market. Unfortunately, the entire thing collapsed just before the book was due to be released. In the meantime, however, Samhain had been through some fairly major upheavals and staff changes, which made it easier for me to consider them again. So, having already decided I now didn’t care too much if this particular novel was published by someone else, and already having proved to myself that it was a book people would read and enjoy, I subbed it to Samhain, and to my delight, accepted it very quickly. My new editor, Tera Kleinfelter, is just a joy to work with - it helped that she thought the book was already very well edited so the editing process was pretty swift and easy from her side - and I’m happy with the result and the cover. TGE: When I read about hero Connor Hutchens’ “scientifically enhanced senses,” it reminded me of Steve Austin from THE SIX MILLION DOLLAR MAN. That begs the question: How much did all of Connor’s enhancements cost? AS: Oh, a lot :) But his father’s an immensely rich mad scientist, and makes a fortune out of selling the implants for which Connor acts as test subject and advertisement, so money’s no object. TGE: If Connor Hutchens fought Steve Austin in a fight, who would win? TGE: Based on the excerpt, it seems to me that even though Connor has enhanced senses, hero Devlin Grace possesses the higher “emotional IQ” of the two. Is that an accurate assessment? Without mentioning spoilers, what can readers expect from this romance? AS: Devlin is definitely a more rounded and stable human being. Though he’s the product of a broken home, he has a strong and loving family behind him, and particularly a mother who supports and believes in him. Connor’s a twice adopted child and his father is a cold, highly intellectual man who believes praise makes his sons weak. So Connor lacks confidence in his likeability and attractiveness as a person, and takes the teasing and tough and tumble of a team environment to heart more than he should. Devlin is able to help him deal with that better than he has in the past. But it’s not all one way. Connor is incredibly loyal, and intelligent, and capable of a lot of affection and joy, given the chance. So you see him grow in confidence, while Devlin learns how to temper his own fairly robust attitude to life and people to accommodate a very special man. TGE: With many science fiction romances being set in space, it’s exciting to learn about one set in the near future—2042, to be exact. What kind of worldbuilding research was involved while writing SOMATESTHESIA? AS: A lot of the research was done during my science degree, because climate change and the environmental impact of human activity was something I studied. I’ve always been interested in alternative energy, alternative ways of making stuff like plastic and so on, so it was just a matter of sitting down and thinking about how the aims of the present Obama administration regarding fuel independence would affect America. When I wrote this, the brief massive spike in oil prices had really changed consumer behaviour, so it was easy to extrapolate from there how a permanent shortage of oil would change the way we live. I wasn’t interested in a doomsday scenario because we know this is coming, and people are already planning for it, albeit not as fast as we could be. But I see how it will change all kind of things like the availability of imported foods (so coffee in this story is a luxury available only to the super rich) and cheap meat, and care ownership and so on. The story isn’t about post-peak oil - that’s just the background. TGE: What’s your favorite science fictional element that you created for the story? AS: Dunno if I ‘created’ it, but Devlin being able to share what Connor sees and hears through the heads-up display glasses was cool. TGE: What are a few of your favorite science fiction romance books, films, or TV shows? AS: Blade Runner. The Earthsea stories. Enemy mine. The Left Hand of Darkness. Torchwood. TGE: Is there anything else about SOMATESTHESIA you’d like to share? TGE: What can readers look forward to seeing from you in the future? AS: More like my self-published Different Senses series which have romantic elements, but aren’t conventional romances. Strong plots and characters, dealing with serious issues. Oh, and the occasional sound thrashing! Ms. Somerville, thanks for your time, and for your art. Don't forget to visit Ann Somerville's Web site and blog for more information about her books. Now for the giveaway! For a chance to win a digital copy of Ann Somerville’s SOMATESTHESIA, all you have to do is leave a comment for this post. Two winners will be picked! Discuss your favorite TORCHWOOD or SIX MILLION DOLLAR MAN episode. Better yet, if scientists could equip your body with any kind of extraordinary enhancement, what would it be? The contest will run until 9 p.m. EST on Saturday, April 24, 2010.